Simple, intuitive control panel for easy operator training and use. External fill-port provides easier access to fill solution and water. 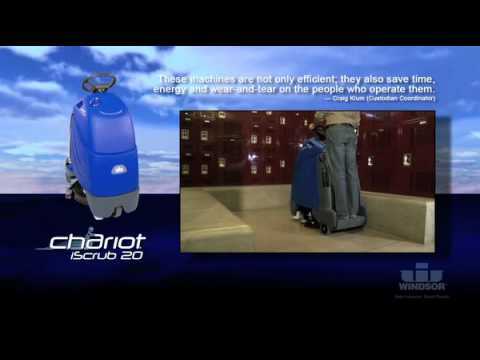 With a lower investment cost, higher production rate and simplicity of maintenance, the Chariot iScrub 20 meets and exceeds all expectations with up to 58% operational savings versus competitively sized walk-behind scrubbers. Designed with Windsor's Chariot Patented Stand-On Cleaning Technology that significantly increases productivity and cleaning quality. 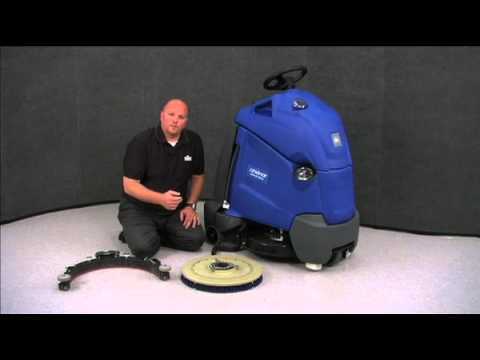 Swiveling no-adjustment squeegee, with Aqua-Mizer[TM] functionality that ensures 100% water pick up for dry, safe floors. Design and size that provides remarkable maneuverability, and best-in-industry 360° visibility that allows the operator to see more of the cleaning area. Intuitive control panel with two transport speeds and two operating speeds, and an easy-to-clean, fully accessible hygienic recovery tank. Quiet operation for daytime cleaning. Operator-presence foot pedals for safety during operation. Pivoting squeegee for 100% water pick up. Tie-down bar provides easier transportation. Weight: W/o batteries: 209 lbs.